Late winter snow and rain are setting the stage for a stunning spring in Mono County, with magnificent waterfalls and vibrant displays of wildflowers expected throughout the Eastern Sierra. Waterfalls will be surging this spring, when the wildflower season is just getting started (they tend to peak mid to late summer). If the timing is right, guests can catch the two seasonal spectacles in one trip, though! Stay tuned to our Facebook, Instagram, and/or Twitter feeds for up-to-date pictures and information. Lundy Canyon, just north of Lee Vining, hosts an abundance of spring beauty, with meadows swathed in columbines and yellow wallflowers. The trail is also touted as showcasing at least three sets of waterfalls, along with some picturesque beaver ponds. The moderate hike begins from a grove of aspens and follows Mill Creek, passing by the 70-foot Lundy Canyon Falls, as well as a myriad of other cascading streams and waterways, eventually reaching the final waterfall that cascades down from Lake Helen and the Twenty Lakes Basin trail. Horse Creek Trail is a four-mile hike in Bridgeport at the west end of Twin Lakes. 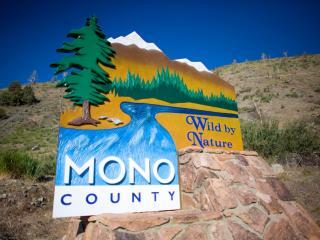 The trailhead is conveniently located at Mono Village Resort and meanders by the popular Horsetail Falls, Sawtooth Ridge, aspen groves and expansive patches of Indian paintbrush and yarrow. For non-hikers, there’s the 300-foot Leavitt Falls, which can be viewed from a vista point on the east side of Sonora Pass/State Route 108. Located at a 7,000-foot elevation means the snowpack melts earlier than other parts of the region, making its peak display in early spring once Sonora Pass is open. 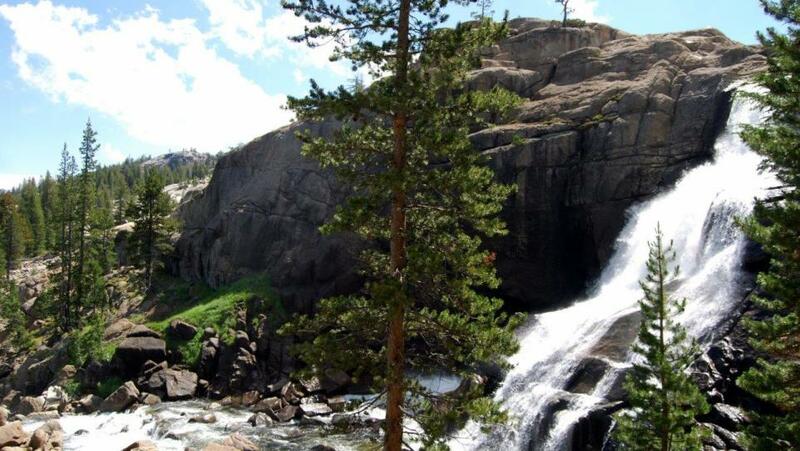 Rainbow Falls is one of the most majestic waterfalls in the Mammoth Lakes area. Its location is accessible by a 1.5-mile walk from the Reds Meadow area in the Devils Postpile National Monument area. The falls can also be reached via a 2.5-mile path from Devils Postpile. Best done in the cool, early morning hours. There is a minimal shuttle fee from Mammoth’s Main Lodge parking area to the trailhead. Virginia Lakes Falls are also worth exploring. A creek flowing from Blue Lake to Big Virginia Lake creates two cascading sections surrounded by colorful rocks. The trailhead is easily located at the end of Virginia Lakes Road south of Bridgeport. Park at Big Virginia Lake and follow the path to the west side of the lake and the inlet. Catching the wildflower bloom depends both on snowfall accumulated in the winter and the speed with which it melts. Wildflowers at the higher elevations tend to peak later in the season. A number of trails and meadows welcome the splash of summer color throughout the region - read more here about some of our favorite locations. For more information, please download Wildflower Hot Spots of the Eastern Sierra guide, or pick it up at visitor centers in Mono County for a small donation.